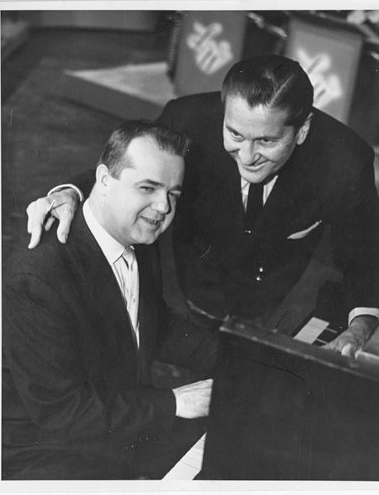 Frank Scott was a pianist, harpsichord player and musical arranger on the Lawrence Welk Show from 1956 to 1969. Scott was born on Jun 21, 1921 in Fargo North Dakota and began taking piano lessons at the age of eight. After attending North Dakota Agricultural College for a year, he dropped out to pursue a music career in the early 40’s as a heart condition prevented him from serving in WWII. He served as music director at radio station WDAY in Fargo from 1944 to 1956, where he arranged over 2,500 songs. In 1956, Lawrence Welk asked Scott to join his TV Show which had just debuted the year before. He stayed with the Show until 1969, and decided to return to Fargo, becoming a teacher at North Dakota University. After the death of his first wife Janette in 1979, he moved back to California and formed his own orchestra which featured fellow Welk Show alumni Art Depew, Don Shelton and Arnold Fishkind. He remarried in 1993 and passed away in 1995, leaving behind an impressive collection of over 7,000 song arrangements.